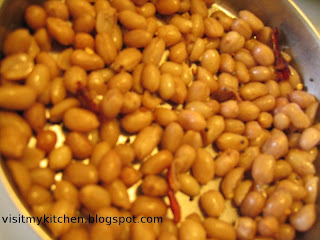 Pressure cook the peanuts for 20-25 mins/ till cooked. In a tava, add 1 sp of oil, temper mustard and red chilli. Add boiled peanuts and saute for a minute. 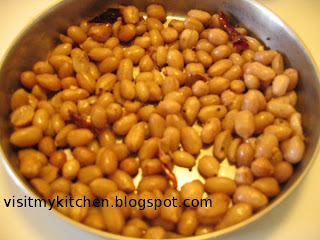 would love to munch on this peanuts with a hot cup of tea.. Regarding the Mw cakes, they do taste good, but the texture differs when compared to the oven made cakes..its not spongy, but somewhat a chewy kind of...give it a try..you may like it..